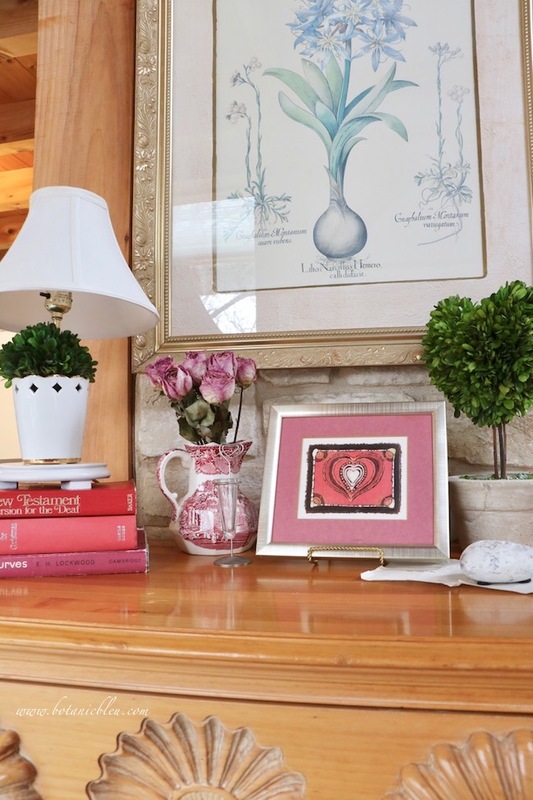 Tips to display vintage Valentines will give you ideas how to add a treasured Valentine to your home's decor without going all out in every room or on every surface with Valentine decorations. With a single treasured Valentine and a handful of complementary items, you can celebrate the day dedicated to love in your usual decorating style. A Vintage Valentine's Day Blog Hop! 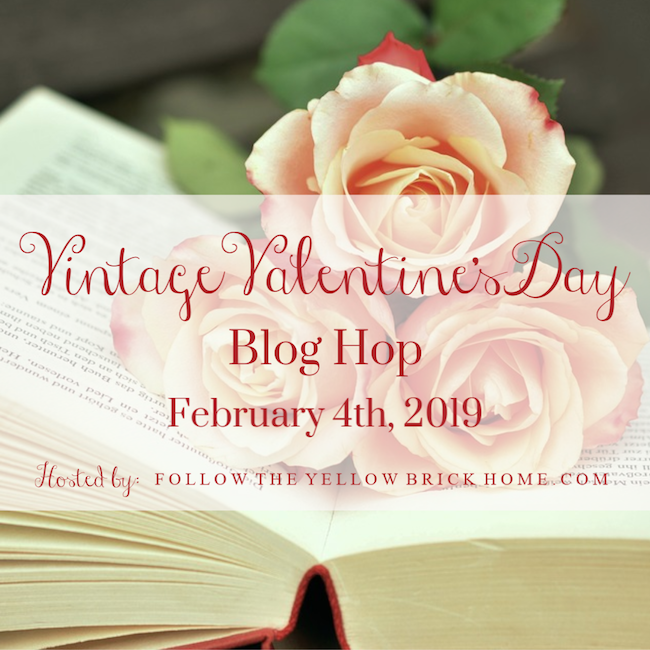 Thanks to Amber at Follow the Yellow Brick Home for organizing over 20 blogs to share ideas using vintage Valentines with you for your home. You can find links to all of the posts at the end. If you are coming from Katie at Let's Add Sprinkles, you already have some good ideas for how to use vintage Valentines. If you haven't been to Katie's blog yet, you don't want to miss it! Katie and I live within 15 minutes of each other and are friends in real life, not just online friends. Whether you are having a party or merely want to add a touch of romance for the month of February, here are some tips to decorate for Valentine's day with an extra special vintage Valentine. Any number of places will work to display a special vintage Valentine, but good choices are table centerpieces, mantels, coffee tables, kitchen islands, buffets, shelves, or chest of drawers. A pine chest of drawers sits at the end of our fireplace and is visible from both the kitchen and the living room. 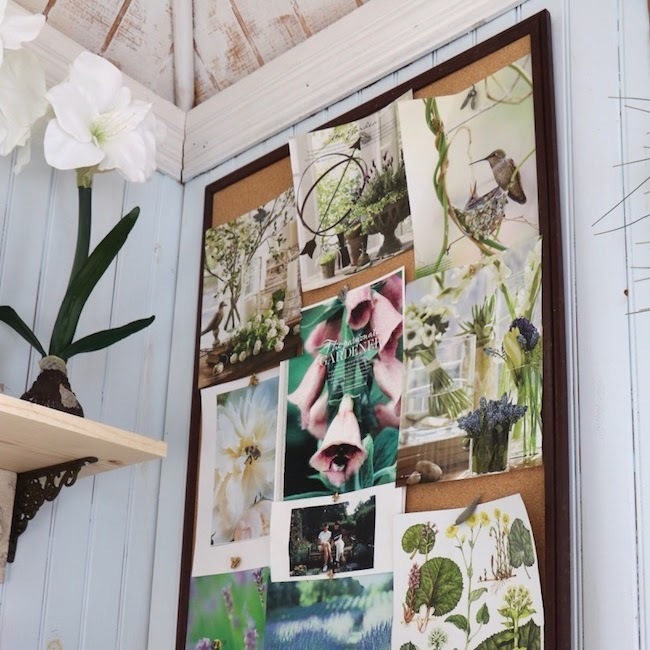 Since these two connected rooms are the heart of our home, the spot is a great area to decorate. Both family and guests see this chest of drawers up close. From an online search for a definition of vintage, the results did not give a definitive answer. Some recognized experts and some self-proclaimed experts cited 20 or 30 or 50 years or older. Other "experts" cited vintage as an adjective to describe a time period... vintage 1960. Most stated vintage depends upon the item being described. Vintage clothes require one age standard whereas vintage autos require a different age standard. Yet, others defined vintage as it applied to its original use... vintage wine. Whether your special Valentine meets the definition of vintage is irrelevant. Any treasured Valentine from a loved one is worthy of being the center of a special arrangement. My most treasured Valentine was handmade in the 1970s by a street vendor on the campus of the University of Texas in Austin. The Valentine is not paper, but fabric printed in the hippy-style of batik. The small scrap of fabric has ragged edges and was relatively inexpensive, but was a splurge for a college student's budget. Red, pink, mauve, or the trendy blush are traditional colors associated with Valentine's Day, but if you love another color and have a Valentine in that color, by all means use that color. Many years I create special Valentine arrangements in blue. Since the vintage Valentine will be the focus of the Valentine grouping, the color of that Valentine determines the colors for all the other items surrounding it. After choosing a special Valentine as the focus for your arrangement, assemble items to use with it. You want a mix of textures, heights, and objects with meaningful stories to you. 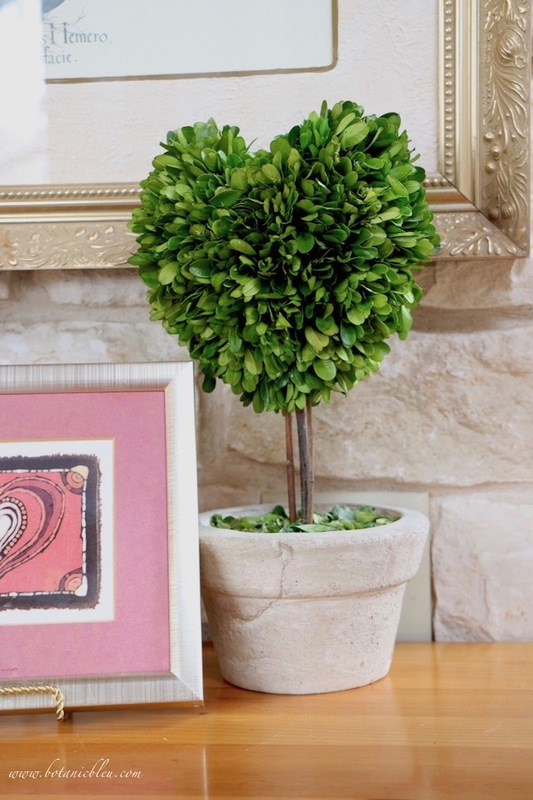 With its unusual special heart shape, the topiary itself could be the focal point in a different Valentine display. Purchased while peeping at Fall foliage in Maine, the topiary reminds me of the trip with my sister. Red roses are another traditional Valentine's gift, and the vintage pitcher belonged to my mother who received it as a gift from Victoria, Canada in the late 1960s. A stack of books is one of the ways to adjust the height of objects sitting on top of them. You can collect used books based on the color of their covers for decorating. Thrift stores, garage sales, estate sales, and your grandparents' attics are your best sources for inexpensive used books. Ebay and Etsy may have collections of used books in the same color for sale, but the prices typically will be higher than books found from the original owners. For Valentine's Day, shades of red coordinate with my batik Valentine. However, these books were not collected solely to use in decorating, but have meaning in my life. The New Testament: English Version for the Deaf belonged to my dad. I gave this copy of the New Testament to my dad for Christmas the first year it was published, not because he was deaf, but because he supported the translation center that translated it. Mother gave it back to me after Daddy's death. My personal Long Tall Texan (not my dad) was the lead Hebrew translator who worked on the companion Old Testament edition of the Bible for the deaf. Murder for Christmas is one I bought a few years ago. I love Christmas and a good mystery! The Book of Curves is a book about unusual mathematical equations and the graphs they create. I was a high school math teacher for 29 years before becoming a high school administrator and then serving as the school district's advanced academics' coordinator for the K-12 gifted program. The curves in the book are fascinating to me. Probably not fascinating to just anyone, though. Remember, choose items meaningful to you. As usual for me, there is a bit of French in the vintage Valentine display. 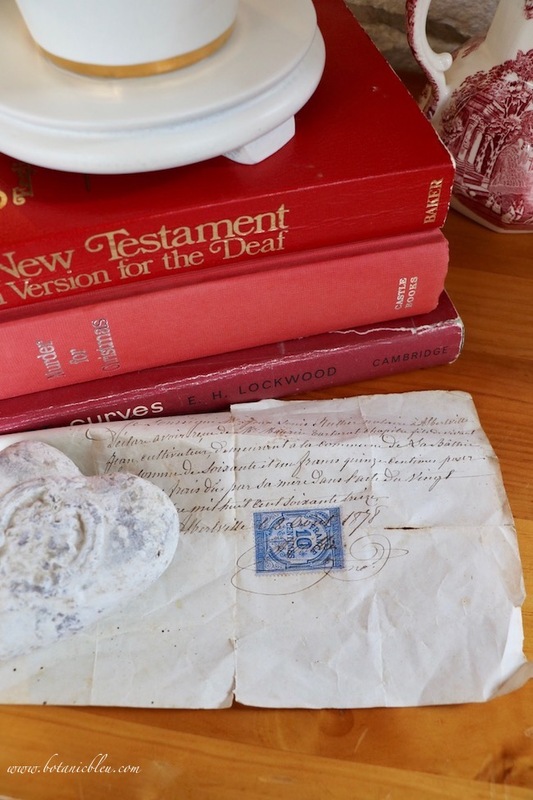 The white ceramic heart weighs down an antique French ephemera document, dated 1878... definitely an antique, not just a vintage document. 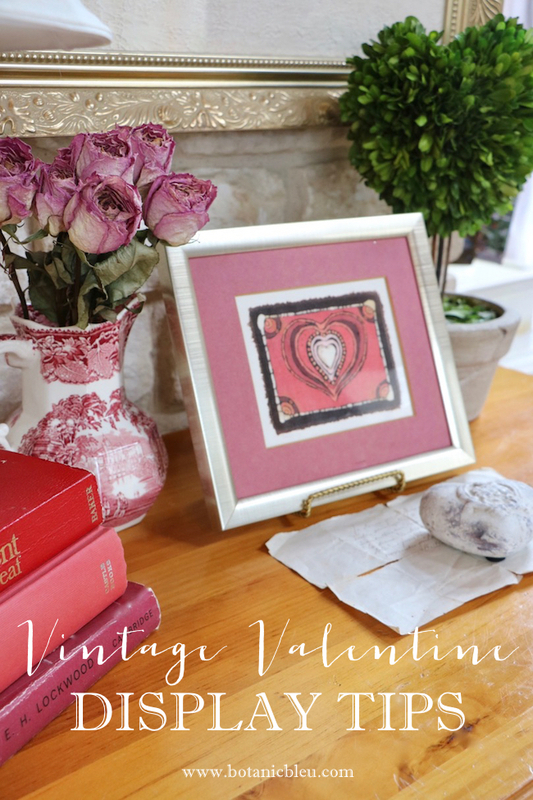 Pull out your saved boxes of old Valentine's Day cards from friends and family, and choose one special card to be the centerpiece of a vintage Valentine display. 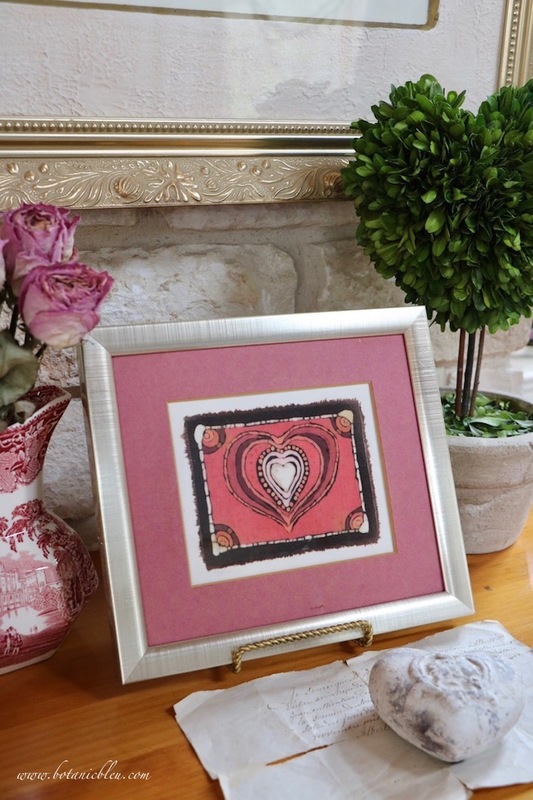 Place the card in a frame, and surround it with accents that say Valentine's Day with meaning to you. 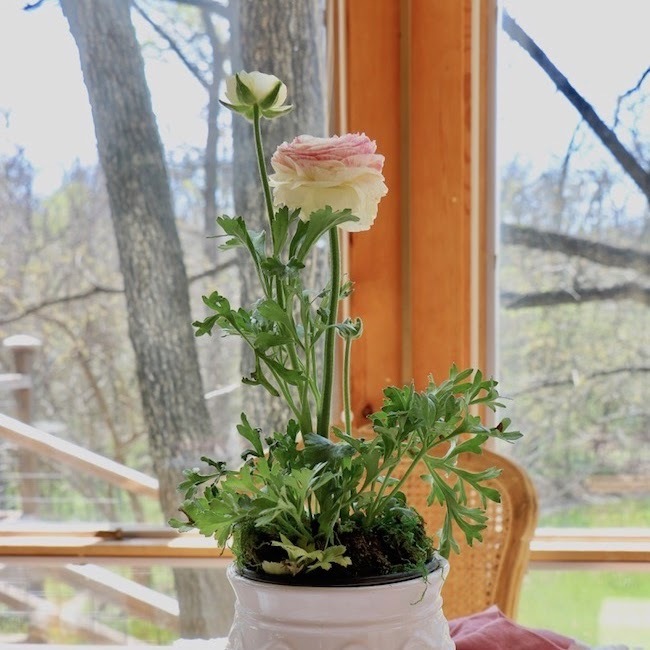 Next up in the blog hop is Jann at Have a Daily Cup of Mrs. Olson. 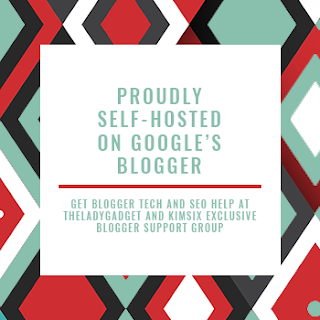 Jann is one of the sweetest bloggers I know. 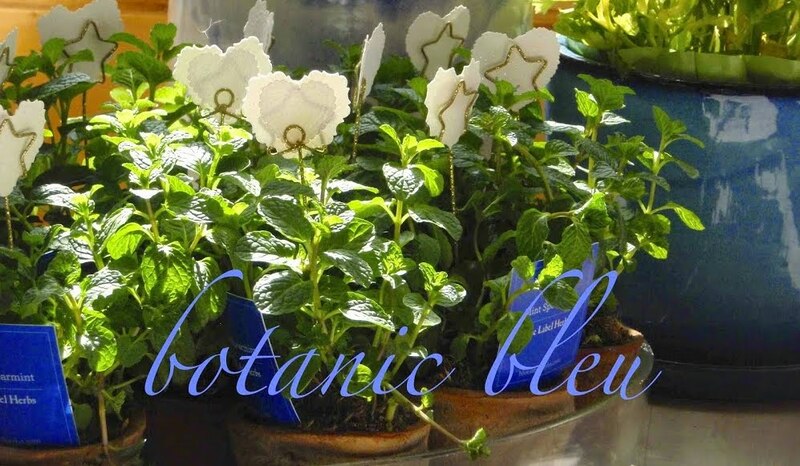 She was one of the very first bloggers who reached out to me and became a follower when I started writing Botanic Bleu. So, I am surrounded by love on this blog hop... Katie before, and Jann after! Just what Valentine's Day is all about. visit all of my good friends below. Please PIN to let others know how to find great ideas for vintage Valentines. 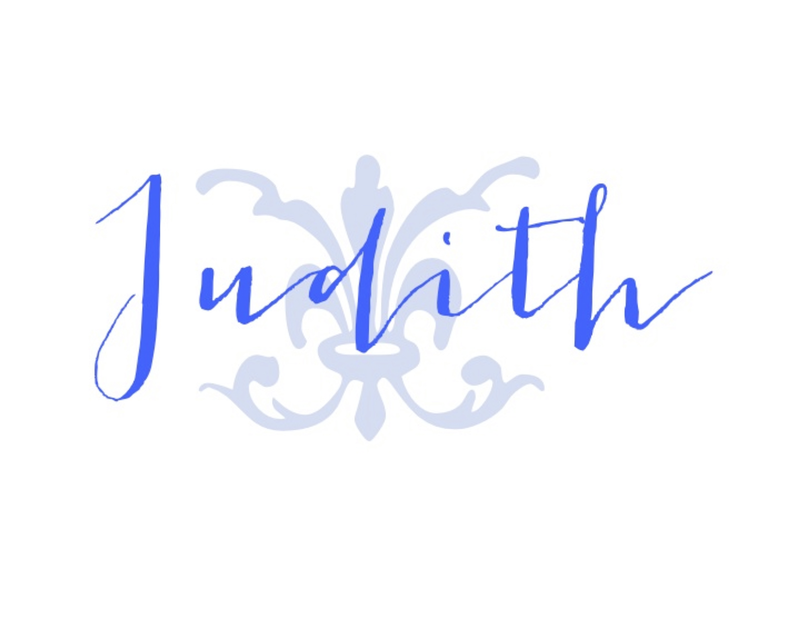 What a treasure, Judith. It's such a lovely card. love the vignette. Your pitcher is fabulous. 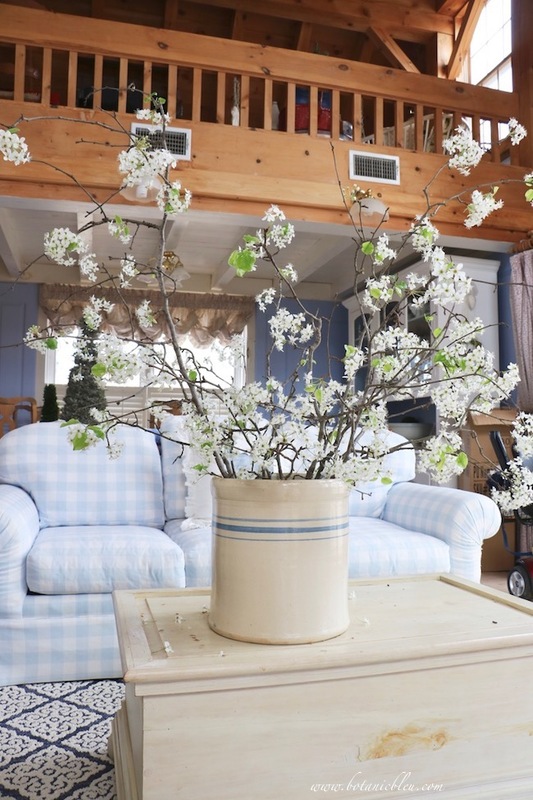 You have decorated with what your heart loves and created a lovely vignette. Pinning for inspiration! So very lovely! 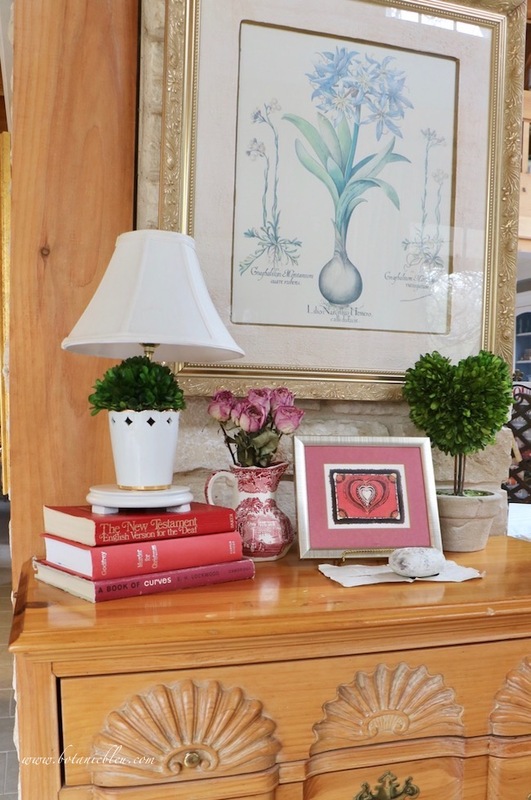 I just love the subtle ways you incorporated a little Valentine's Day into your vignette. Those dried roses are stunning! How nice to be linking up with your friends! I love your Valentine displays tips and all your pretty pieces. I always save cards so I really should bring mine out and display them too. Great ideas! I never knew you and Katie lived so close to each other! Love that. And all of your Valentine touches are perfectly romantic and happy. I adore that heart shaped topiary! Happy Valentine's Day Judith! And I'm determined to get to your Christmas sale next year! 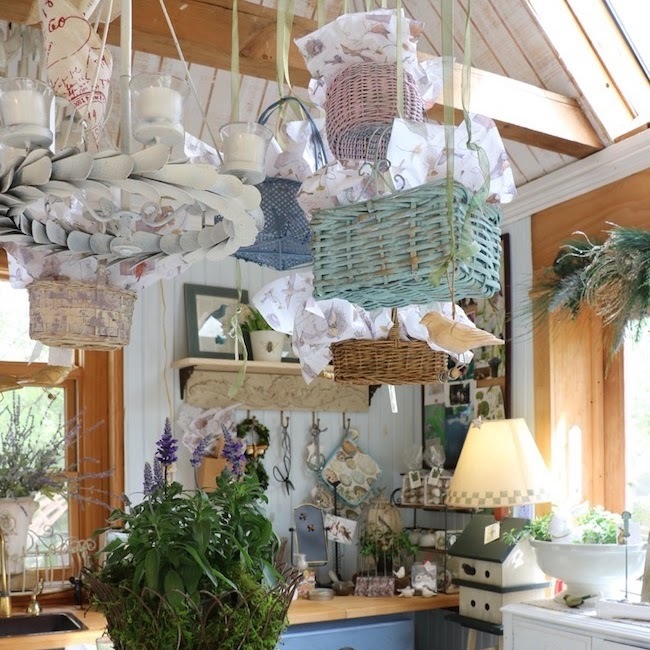 Such a beautiful vintage display in your home. I love the heart preserved topiary! I hop you have a happy Valentine's day. Judith, I l love your ideas for displaying Valentine decor. I've never thought of using red~binded books. That's a great idea. The red stoneware pitcher is beautiful.I'll try to visit you in the spring. Everything is so pretty, but especially that topiary heart. How wonderful that looking at it brings back memories. Lovely Valentine's ideas, Judith! 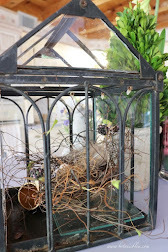 It really is fun to see the ways you can put things on display...I really loved the roses in the transferware pitcher! So pretty! I enjoyed doing the hop with you! 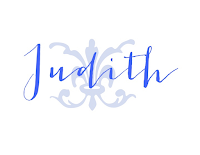 Judith I really enjoyed reading this post and finding out more about you! You provided some great styling tips for Valentine's Day. 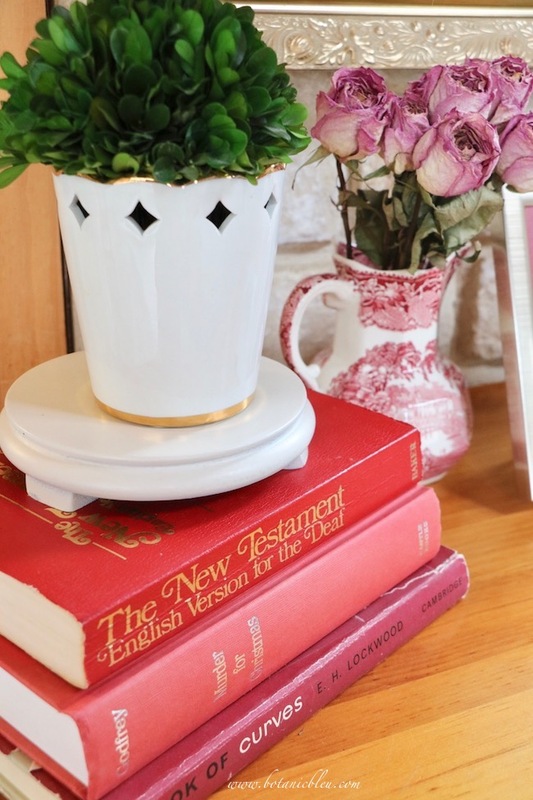 Books are so great in any vignette and I love that yours have special meaning. 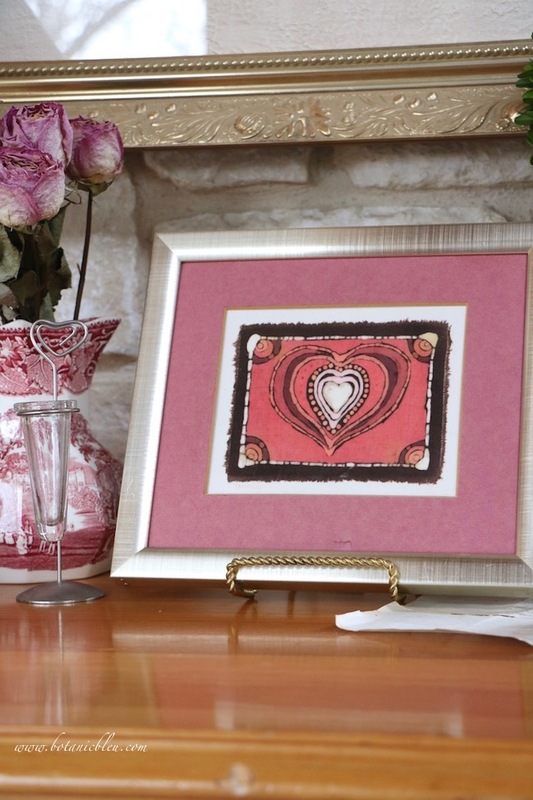 Your framed Valentine is so interesting! Of course the antique French ephemera is wonderful! Thank you so much for joining this hop. Have a Happy Valentine's Day! Such a special treasure you have and I loved the tips you shared! I sure enjoyed joining you on this blog hop. Hoping you have a wonderful Valentine's Day! I so much enjoyed seeing your vignette and reading about each piece that you shared. Your fabric heart from the 70's is so pretty and I've never seen anything like it. Did you dry the roses in your mother's transferware pitcher? I've always wondered how to dry roses. Using red books for V'day decor is a good idea. I'm also a former teacher so the math book caught my eye! Beautifu display tips, Judith. I always find your home to be so perfect! Glad you found that heart topiary on your trip. I've never seen a heart shaped boxwood. Happy Valentine's Day! Great display tips, Judith. And a lovely display; I especially love the heart topiary.Happy V Day! Judith, you have created a most beautiful Valentine's Day display with such special sentimental meaning. I love that! 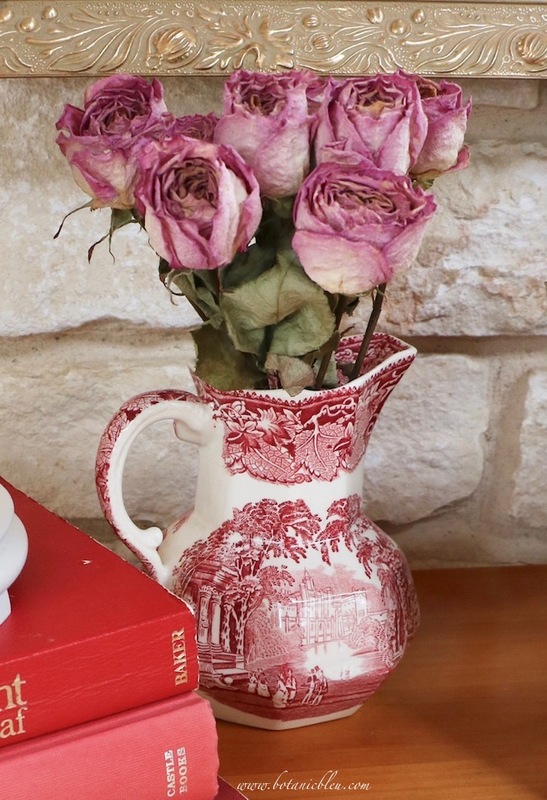 I'm swooning over that red transferware pitcher with the roses...so pretty! It has been so much fun being on this hop with you! Happy Valentine's Day!! !